This week, I have been working on a Leman Russ Battle Tank for my Genestealer Cults army. This should add some serious firepower to the Cult and allow them to punish the enemy army from afar. Hobby work has been a little sparse of late thanks to the weather. 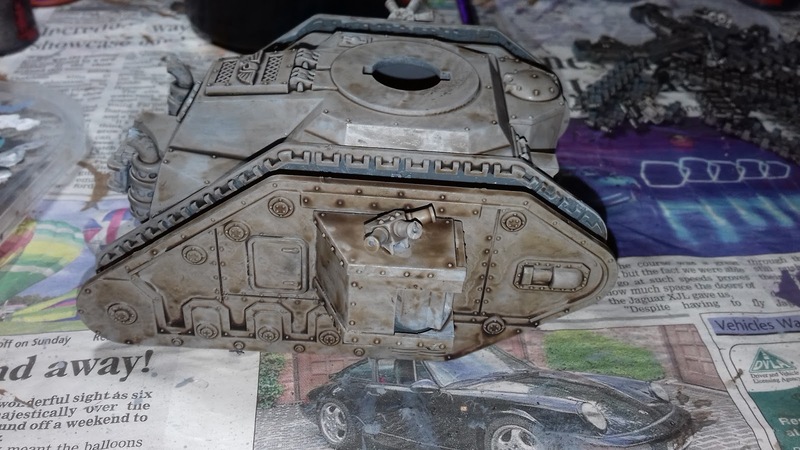 It's been a little cold and snowy to undercoat the models outside, but the warmer weather recently has allowed me to spray the Leman Russ. For me, 2017 has been a great year for 40k, and it has been a pretty good year for St Andrews Wargaming too. I'm going to take a look at what has happened in the last year for me and for the blog. This has been a good year hobby wise for me. At the start of the year, I was well in progress on painting up my Deathwatch army. I had started this force towards the end of 2016 and kept at it as the year began. 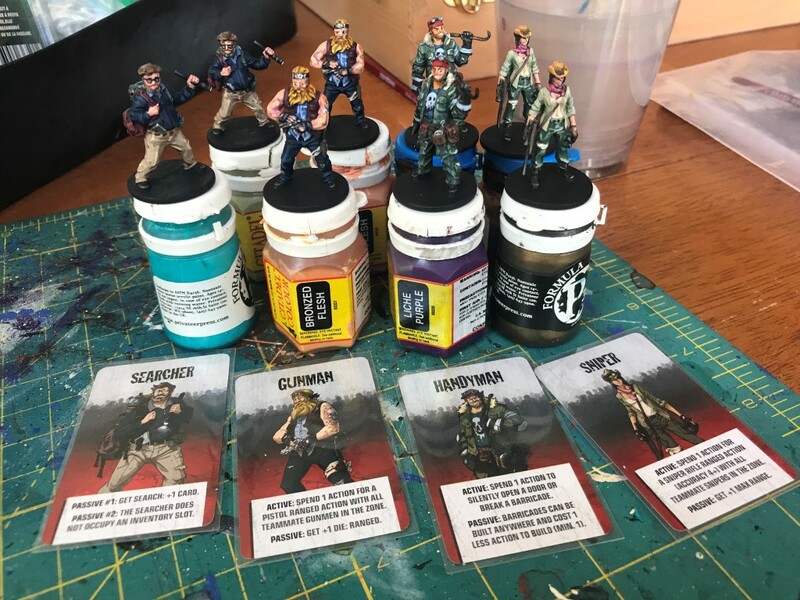 This was helped along by taking part in Squaduary, allowing me to engage in the community scheme to get a unit painted up in February. In September, I completed the army and posted a showcase of the force. I was really happy with how the army turned out, becoming quite a sizeable force when it was completed. I was also very happy to receive a best army nomination at one of the tournaments that I attended. 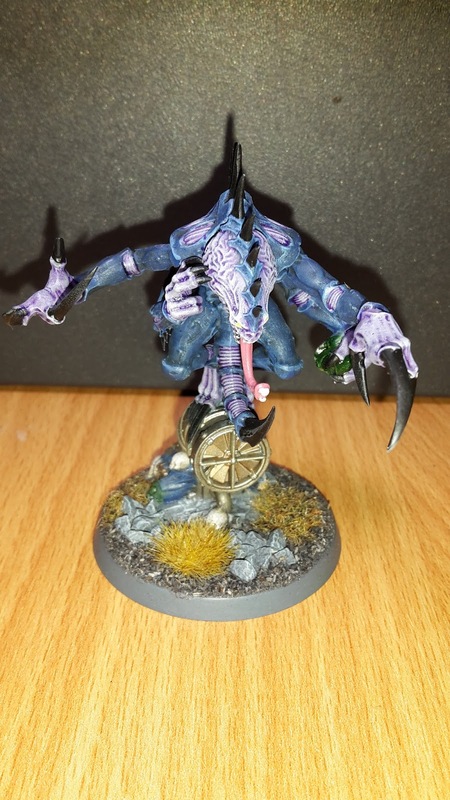 This week's battle report features the inaugural battle featuring my Genestealer Cults army. I have been painting this army up for a few months now, so was excited to finally get them on the table. I know a few of the readers have been looking forward to this as well. 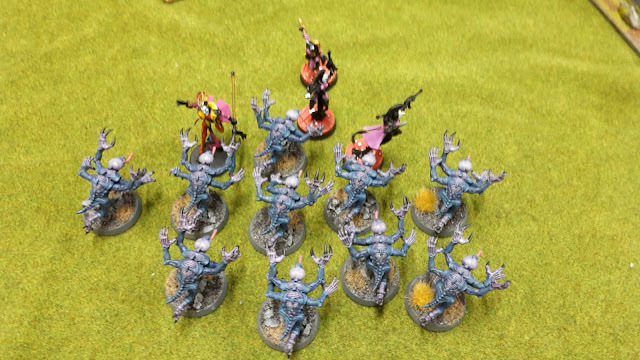 This game was to be against Yaro and his Harlequin army, and was played at the Spiky Club in Reading. As an aside, this was not actually my first time at the Spiky Club. Back in 2003, I was on industrial placement for university in Reading. I regularly attended the Spiky Club all those years ago with my Dark Angels (my only army at the time). Yaro wanted to play 1500 points, as he is building up his Harlequins army and only had enough models for a smaller game. This would allow me to field a fully painted army, as I had enough done to field this level of points. My army featured a mix of unit to try them out for the first time. 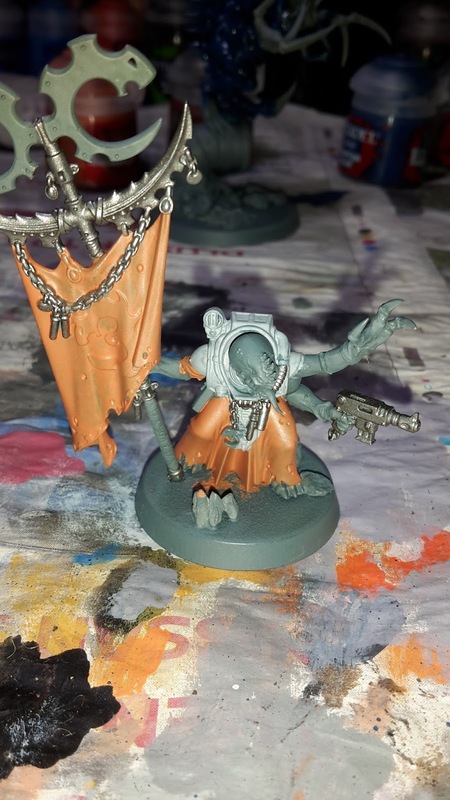 For my HQ units, I took the Patriarch, the Magus and the Primus. The Patriarch is a beast in combat, hitting incredibly hard and going through a lot of armour. I gave him Mass Hypnosis, to stop the Purestrains he would be accompanying from being shot up by overwatch fire. The Magus took Might from Beyond to boost the strength of the unit he was with. 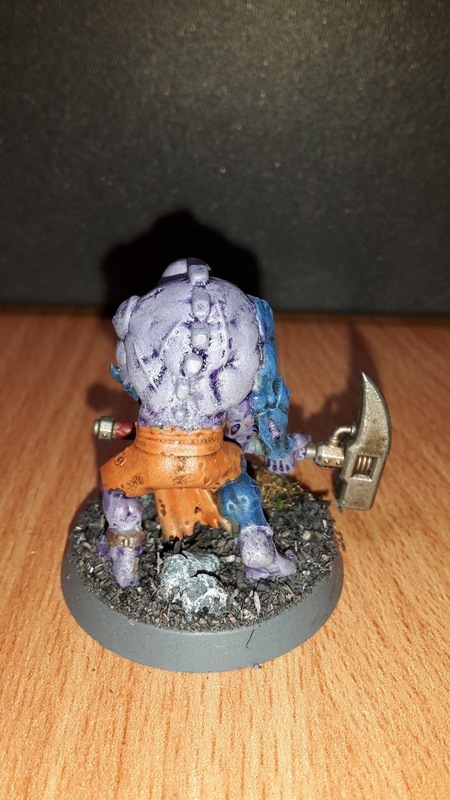 The Primus has some solid combat ability, as well as giving me useful deployment options from Cult Ambush. For the troops, I took two units of Neophytes with Heavy Weapons. 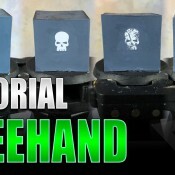 These would be used for holding objectives and taking pot shots at the enemy army. I also took three units of Acolytes. Each had two of the different Heavy Weapons, so that I could try them out and see how they performed in combat. I took 6 Aberrants for some heavy combat punch and put them in the Goliath Rockgrinder. I also took a Goliath truck to transport another unit. 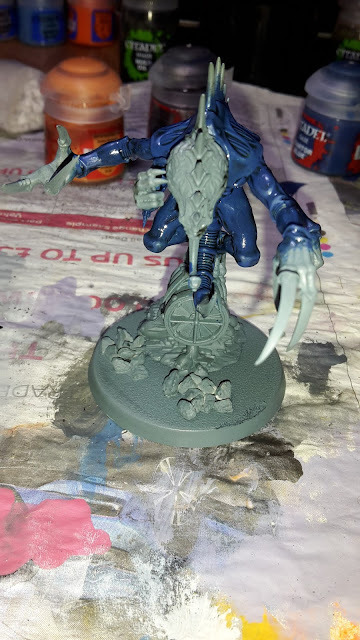 My warlord was the Patriarch, who took the new Genestealers Cult warlord trait. 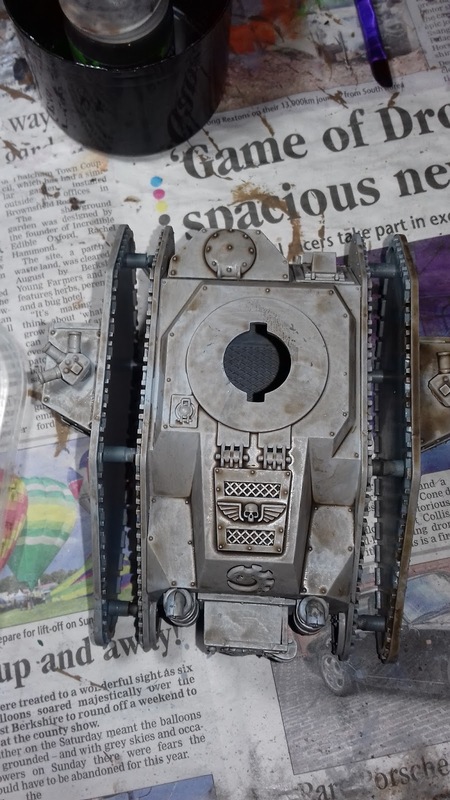 This allows any unit within 6" of the warlord to perform a heroic intervention. Merry Christmas everyone! Hope Santa brought you some hobby goodness to enjoy! 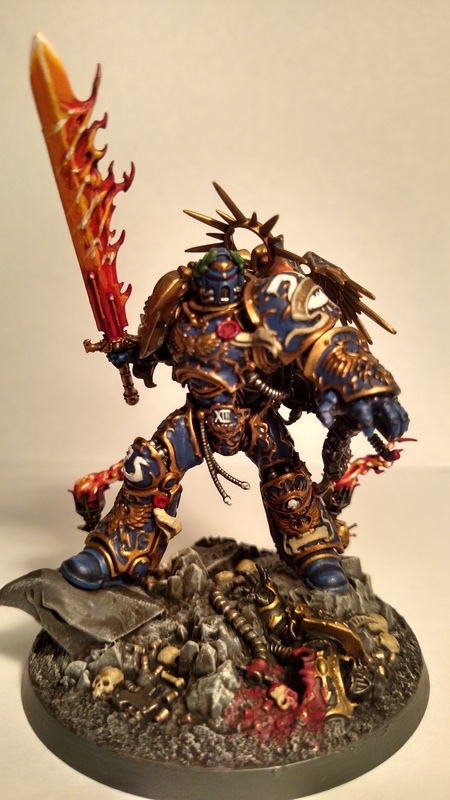 This week's battle report sees my Ravenwing take on Andrews's Chaos Space Marines, featuring the big man himself- Magnus. The Ravenwing launch their attack. The maelstrom mission was Cloak and Shadows using Dawn of War deployment. Sammael was my warlord and took Tenacious Survivor. My Librarian took Aversion and Mind Worm. This game was fought before the release of the new Dark Angels codex. 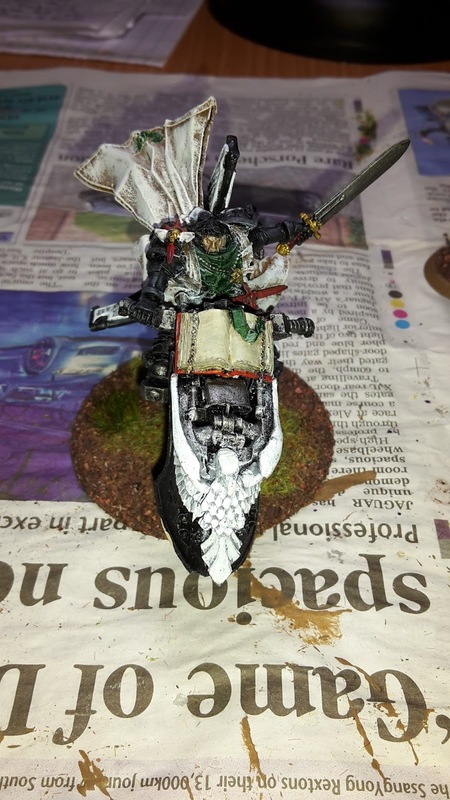 Part three of my 8th edition Dark Angels codex review will take a look at the Ravenwing units in the army. 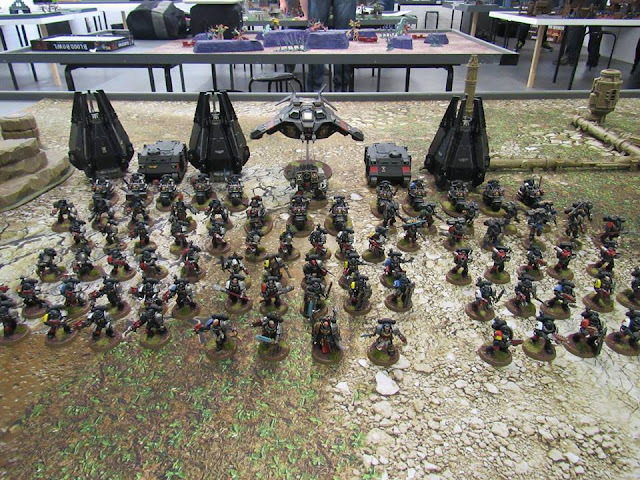 My Ravenwing force is one of my favourite armies and I have been playing them for several editions of 40k. Let's see how the new codex treats the black-clad warriors. One thing I have noticed is that almost all the Ravenwing units got some form of points reduction from the Index. As an example, my recent 2000 pts Ravenwing army that I used in several battle reports now comes in just over 200 pts cheaper in the codex. This is great news and something that I think needed to happen. This will allow me to field at least another Bike squad or some Speeders to bulk out my force a bit. The main special rule that applies to the Ravenwing is Jink. If the unit Advances, it gains a 4+ invulnerable save against all shooting attacks until the start of your next movement phase. This rule applies to Ravenwing units in the army. 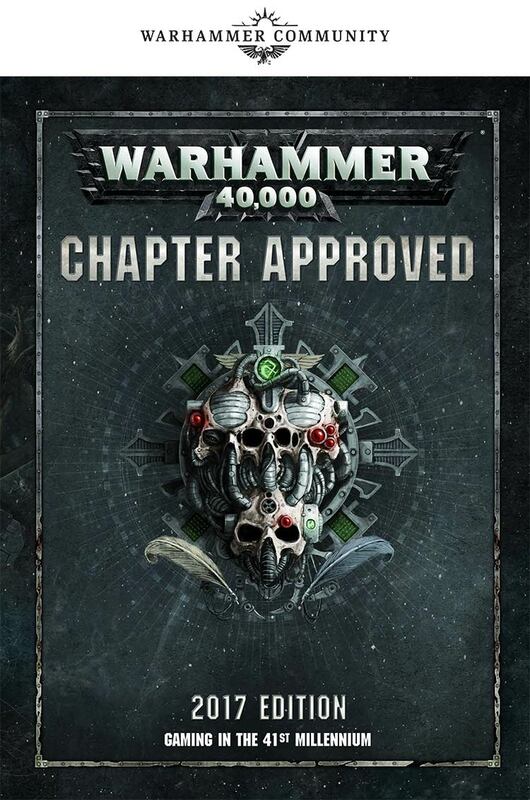 To me, this is a big boost to the Ravenwing units. In the index, they only got a 5+ invulnerable save, but it is now boosted to a 4+ invulnerable. This actually makes a big difference and makes Jink a good prospect for a unit of Bikers and will really help in certain missions, particularly maelstrom ones, I think. You can turbo-boost onto an objective to score it and get a reasonably level of durability against enemy fire. I think this will be a big boost for my Ravenwing army. The Grand Master of the Ravenwing has seen some useful upgrades in 8th edition. As with many characters, he is a lot tougher in the new edition of the game. Sammael has T6 and 6 wounds, a 3+ save and 4+ invulnerable. He also has WS and BS 2+, with 5 attacks, making him quite potent in combat. His Raven Sword thankfully gets a strength boost in 8th edition, being +1S (so 5 in combat), AP-3 and 2 damage with each wound. It also gives him double strength if Sammael charges, taking him up to S9 in combat. This gives him some pretty potent attacks on the turn that he charges into combat. He comes with a twin Storm Bolter and Plasma Cannon, giving him some strong firepower (8 Bolter shots at short range). He also has Fly, enabling him to fall back and still fire. He also provides some really nice buffs, giving re-rolls of 1's to hit with Dark Angels within 6" and full re-rolls for Ravenwing within 6". 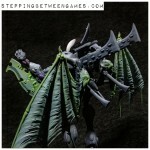 This makes him a great addition to a Ravenwing army, making the most of the powerful weapons the Ravenwing can field. 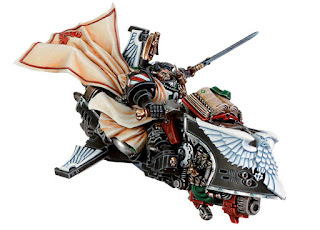 I will definitely be including him in my Ravenwing army in many games. Part 2 of my review of the new 8th edition Dark Angels codex will focus on the new Stratagems for the army, as well as the Interromancy discipline. 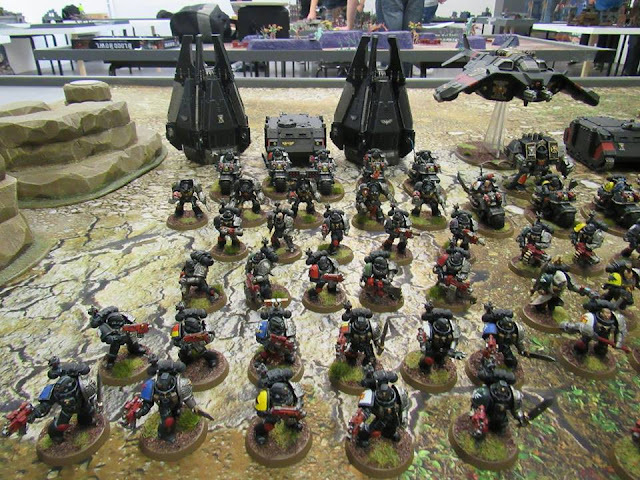 The Dark Angels have access to many of the Stratagems available to Space Marines, as well as some unique Dark Angels ones that add a lot of power to your army. I'm going to take a look at the Dark Angels specific Stratagems in the new book. This is the standard one extra Relic for 1 command point, or two Relics for three command points. This is a decent Stratagem, but one I probably wouldn't use too often. I tend to only take one Relic, but the Dark Angels do have access to some pretty decent ones, so taking one extra could be of use. Used when a unit of Deathwing arrives on the battlefield using Teleport Strike (Deep Strike). The unit can immediately make a shooting attack as if it were the shooting phase. If the unit consists of 5 or fewer models it costs 2CP, if it is 6 or more it costs 3CP. If this was 1CP/2CP, I could see a use for this, but it seems like a very expensive stratagem for the bonus it provides. One good thing is that you get to fire before your opponent can use some form of Interceptor fire or Stratagem, so it could be useful for targeting these units. As Terminators are still not great in 8th edition, I would probably avoid this one in most cases. 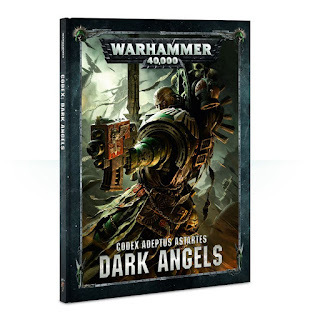 Welcome to part 1 of my review of the new 8th Edition Dark Angels codex. 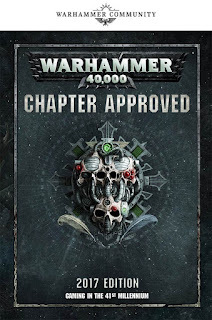 The Dark Angels were my very first army in 40k (far too many years ago), so I was eager to find out what the new edition of the game had in store for them. 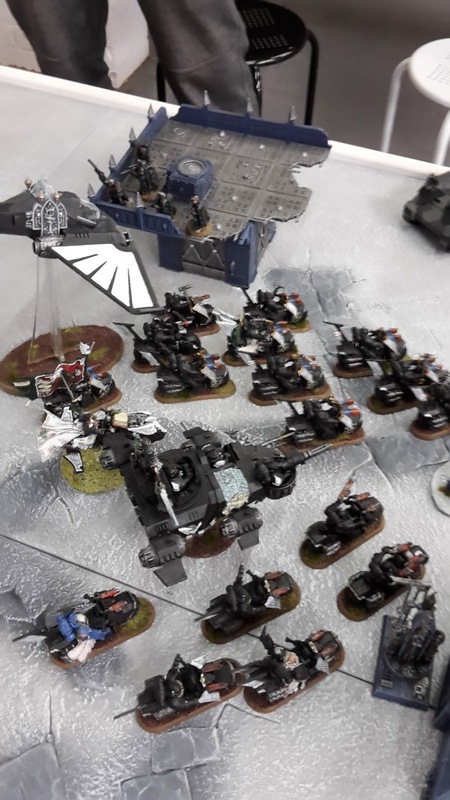 I had already played a few games with my Ravenwing army from the Index, and rumours seemed to suggest good things on the horizon for them. The first part of this review will look at the Special Rules for the army, as well as the new Relics and warlord traits. Part two will look at the Stratagems and Interromancy Discipline. 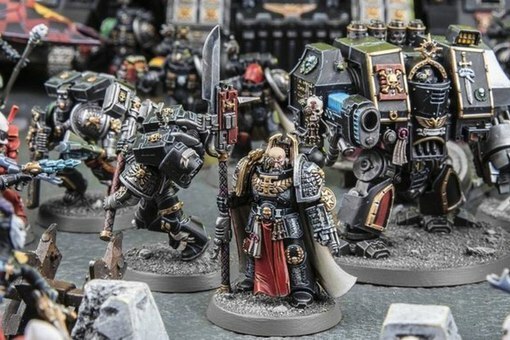 I plan to use a similar format to my last Dark Angels review, so will review all the Ravenwing units together, followed by the Deathwing. If you are not too bored with me by then, I'll take a look at the other units in the army. This is the Chapter Tactics of the Dark Angels army. This means a Dark Angels unit will never suffer more than one casualty as the result of a failed morale test. Combined with And They Shall Know No Fear, this means the Dark Angels army has little to fear from morale tests. A unit of 5 doesn't tend to suffer too much from the effects of morale in a Space Marine army, but this will be very useful for larger units. While MSU is very popular and effective in 8th edition, there are situations where it benefits you to have larger units, such as using Stratagems on a unit, gaining you maximum effect. I can also see it being of use for some Ravenwing Bike units. Say you have a unit of 5 Bikers with two special weapons. You lose three casualties from the unit. If you want to remove the Sergeant to keep the special weapons, you go down to Ld 7 and could lose both models on a morale roll of a 6. It is still a 1 in 36 chance of rolling two sixes in a row for the morale test and losing both models, but it has actually happened to me before. With Grim Resolve, you will only lose a single model. I know this is a rarity, but it can be useful every once in a while. Plus, if you run larger squads, this gives you more cover to not losing a whole unit thanks to a poor morale roll. In addition, a unit with Grim Resolve gets to re-roll To Hit rolls of 1 if they did not move in their prior movement phase. This is a nice bonus for backfield objective holding units such as Scout Squads, Tactical Squads and Devastator Squads. This essentially gives you a free Captain re-roll for these units if they don't move, which is a nice bonus that should really boost their accuracy. I don't think this part will have much effect on my Ravenwing units, as they tend to always be on the move. One thing I have been seeing a lot online is people saying that you will be able to re-roll 1's to hit in overwatch with units as you did not move in your opponent's movement phase. However, the rules says they can re-roll all to hit rolls of 1 as "long as it did not move in its prior movement phase". To me, the enemy movement phase is not the unit's movement phase, so you only get the re-rolls if you did not move in your own movement phase. It will be interesting to see how this Chapter Tactic will work in game terms. 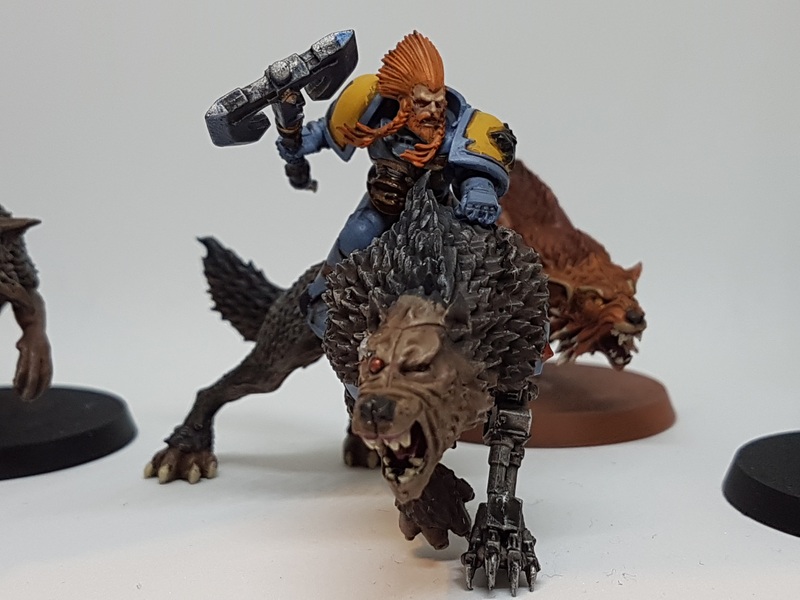 This week's battle report sees my Ravenwing take on Maurice's Crimson Fists in a 2000 pts maelstrom of war mission. Sammael was my warlord and took Tenacious Survivor. My Librarian took Aversion and Mind Worm. I changed up my Ravenwing army from its last outing. I got rid of the Apothecary for the Ravenwing Ancient to give me extra attacks in combat with my Characters and Black Knights. I also dropped the Landspeeder in favour of more Biker units. These would be useful for grabbing me the objectives in the maelstrom mission. This article will show you how to paint up your Genestealer Cult Acolyte Hybrids in a similar fashion to the ones that have appeared on this blog. 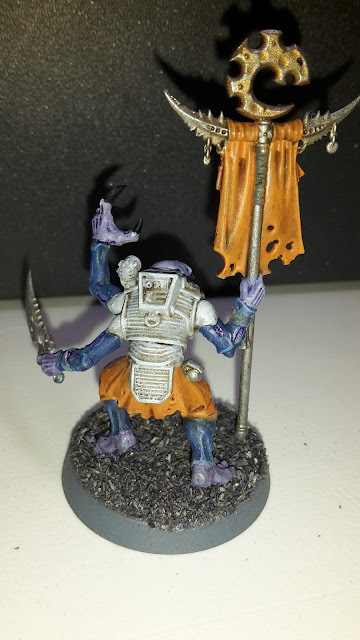 The credit for this scheme goes to the awesome "How to Paint" series from Warhammer TV for the Acolyte Hybrids. I use a simplified version of this scheme for my own units. This weekend, I decided to re-base the remaining members of my Ravenwing army. 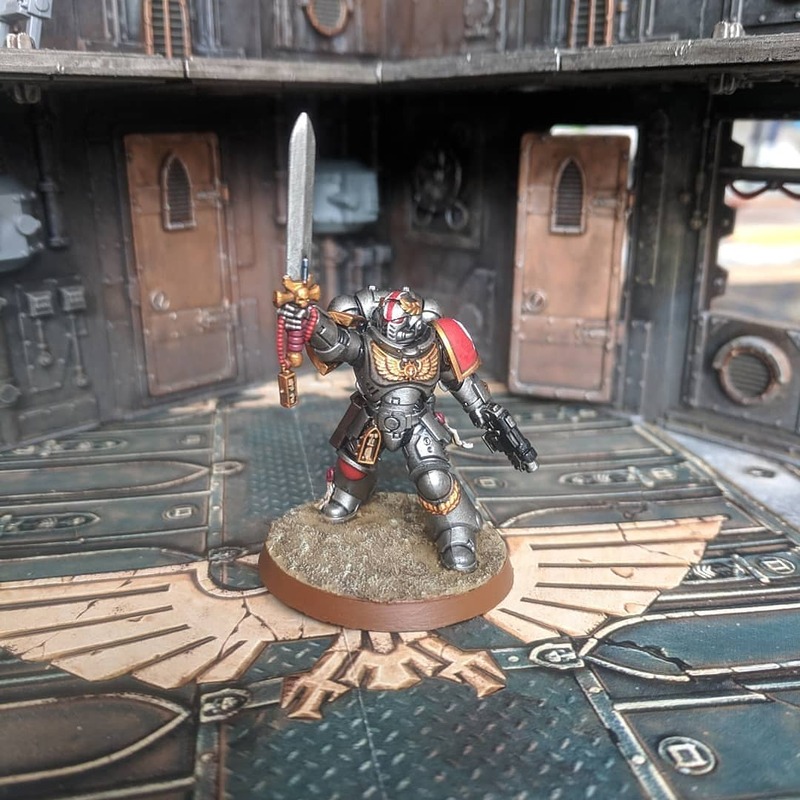 With the Dark Angels codex coming out on Saturday, I was eager to get the army matching bases with the rest of the force, so that I could get some games in with them with the new codex. I am very excited for the new Dark Angels codex. They were my first army in 40k and have been one of my favourites for as long as I have been playing. 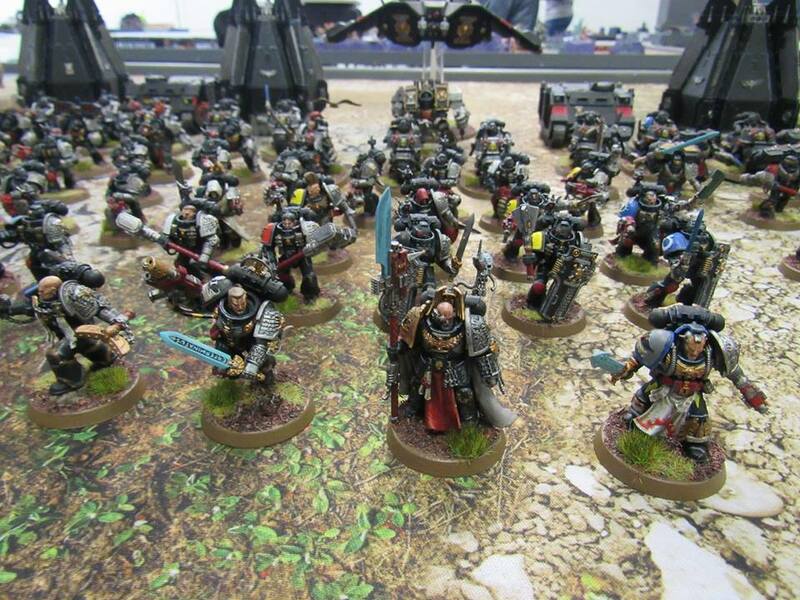 I hope to get a lot of my games in with my Ravenwing army (and perhaps some of the other wings as well). This week, I managed to get another HQ unit painted up for my Genestealer Cult army, the Acolyte Iconward. This model is a nice focal point for the army, with a nice big banner and provides some nice bonuses for the army. 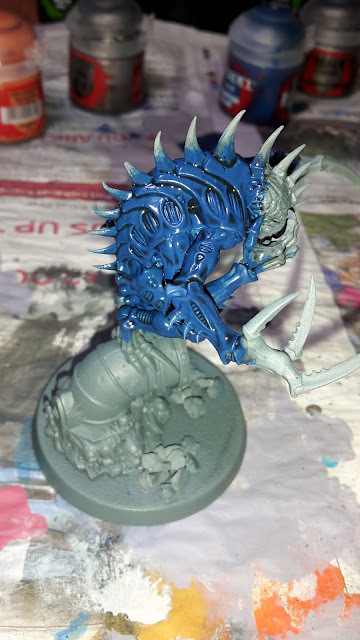 Here are the WIP shots and the finished model. Having taken a short break from gaming to settle in after my move to Oxfordshire, I was keen to find a local club to get back into some great 8th edition action. I found Oxford Gaming Club online and went along last Monday night to try out the new club. 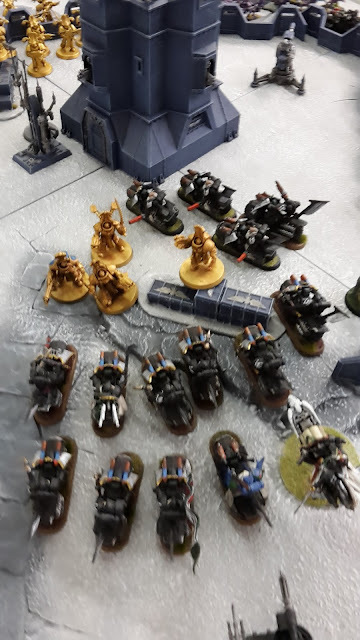 I was able to arrange a game against Stu and his Mechanicus army on the club forum. This was fortunate, as I have been burned a few times just showing up to a new club and not getting a game in. The club meets on a Monday night from 7-10 pm. I prefer a 4 hour club night, but 3 hours is still a decent time for getting a game in (plus writing notes for a battle report). The club members were really friendly and inviting, and it was a good atmosphere. 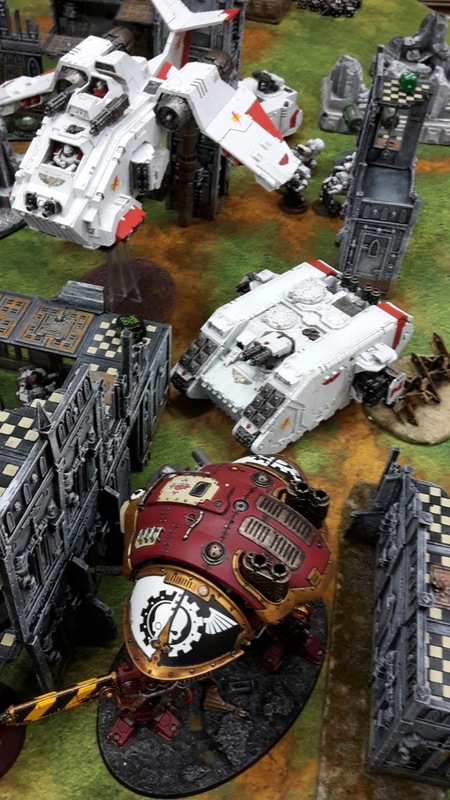 They had some gaming mats to play on and a lot of terrain to fill our table and give my White Scars some good cover from the Mechanicus guns. 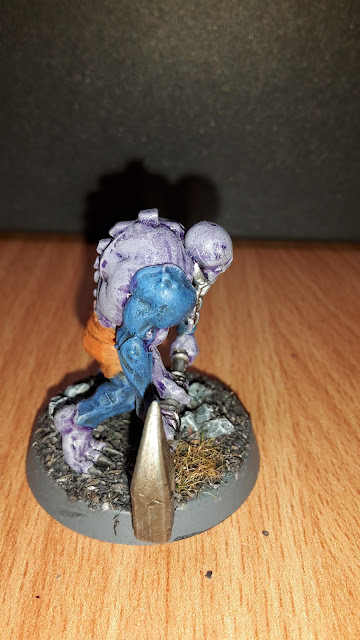 I didn't take full notes for a battle report, but took some photos and a few notes to share with you. I tried something different with the army this time, going for a more mechanised force and using some units I hadn't tried in 8th edition yet. The Captain was my warlord and took Tenacious Survivor. 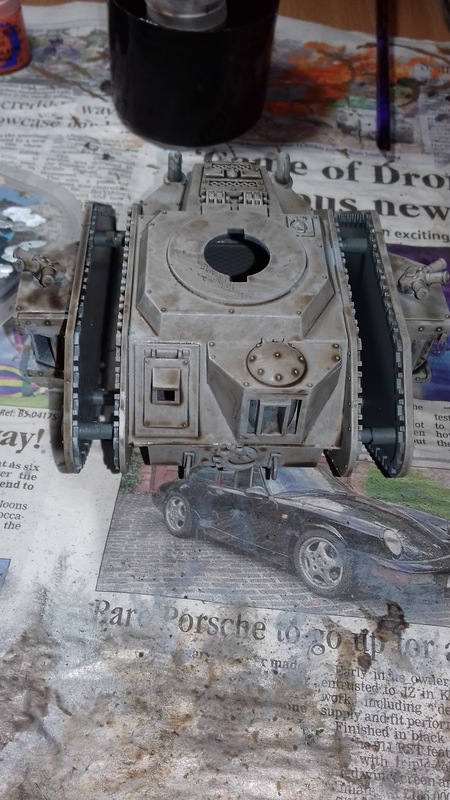 I decided to give the Stormraven and Land Raider a go in 8th edition. I haven't used these yet, but they looked tough with a lot of firepower. I also decided to give the Grav Cannon Devastators a go. 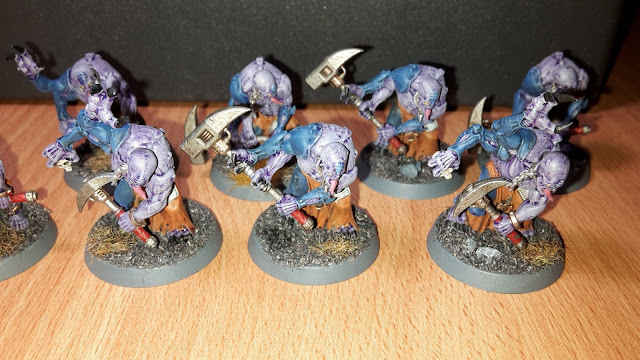 These were a brilliant unit in 7th edition and was interested to see how they performed in 8th edition. 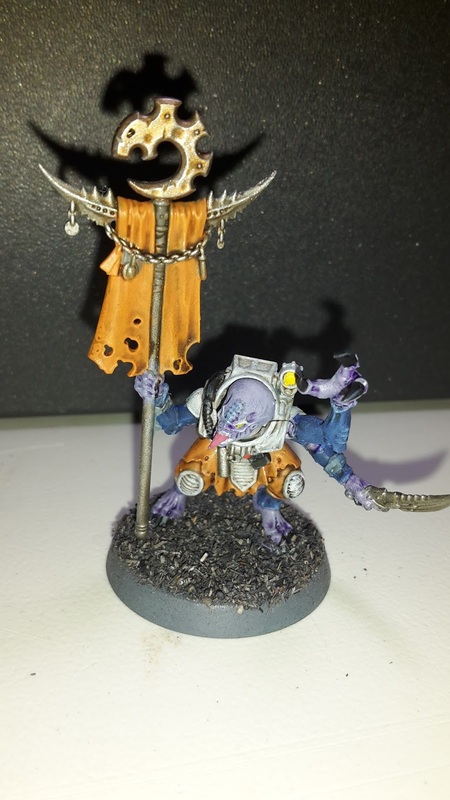 I recently completed another HQ unit for my Genestealer Cult army, the Patriarch. This is a really nice model and was actually pretty easy to paint up. I painted it up to match my Purestrain Genestealers, so that he would match them on the tabletop. 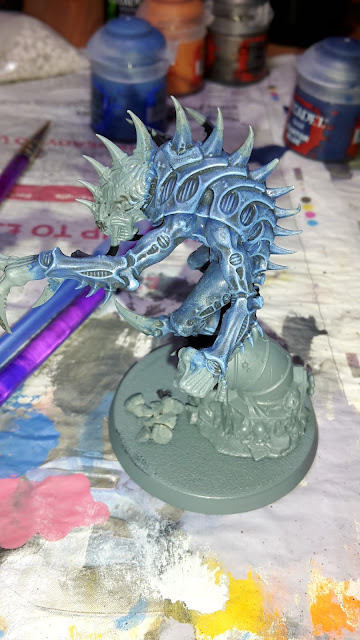 Here are the WIP shots and the finished model. Chapter Approved 2017 features six new Maelstrom of War missions to use in your games of 40k. 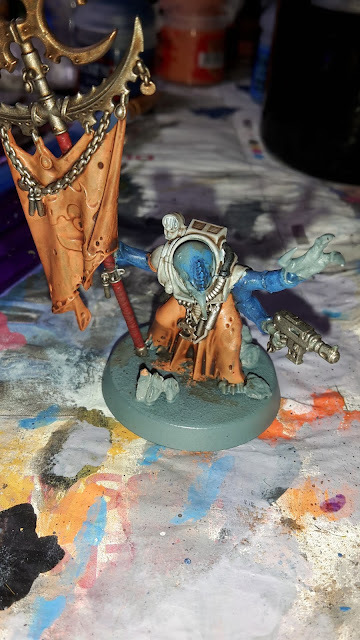 Maelstrom missions are one of my favourite ways to play 40k and have been since they were introduced, so I was excited to see what the new missions would have in store for me. As with all maelstrom games, these missions use 6 numbered objectives for you to fight over. In this mission, each player has three maelstrom cards in their turn. If a maelstrom card involves destroying an enemy unit, it cannot be discarded until it is achieved (any impossible cards can be discarded and re-drawn). In addition, you score one victory point for each enemy unit that is destroyed. This seems like a pretty standard maelstrom mission with 3 cards a turn. The bonuses for killing enemy units would favour an army that can hit pretty hard. Some of these may be difficult to achieve. For example, if you draw Big Game Hunter but don't have the tools to easily take down an enemy vehicle or your tools are all dead. The 2017 edition of Chapter Approved also sees the introduction of 6 new Eternal War and Maelstrom of War missions to add to the 12 in the rulebook. There are six new Eternal war missions presented in the book. A couple of these introduce a new progressive scoring system, which is a nice addition to the rules and I think will encourage more objective holding or taking during the game, rather than just pouncing on them in the final turns. Most of the missions are set up in the same way as the rulebook Eternal war missions. You set up the terrain, place objectives, determine deployment zone and the player that placed the final objective chooses the deployment zone. You alternate deploying units. In these missions, you roll off for first turn (the player that finishes deploying first gets +1 to the roll). All missions score a point for First Blood, Slay the Warlord and Linebreaker. This mission is slightly different in that objectives are placed after choosing deployment zones. This mission uses four objectives. 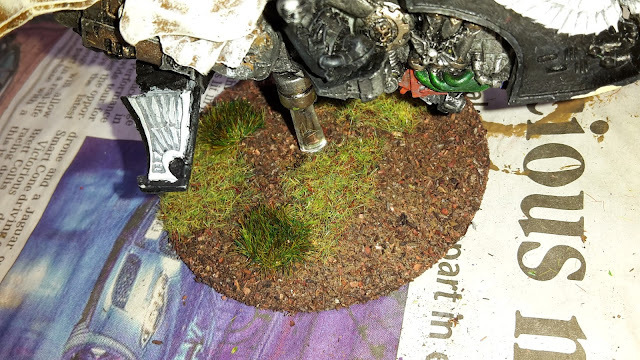 The first objective marker for each player must be placed at least 12" from the centre of the board and at least 12" from each players' deployment zone. This means that for the standard Dawn of War deployment, two objectives must be placed on the central line. The second objective for each player must be placed in their own deployment zone. At the end of the game, the central objective markers are worth 2 points each, the marker in your deployment zone is worth 1 point and the one in your opponent's deployment zone is worth 4 points. This is a mission that encourages players not to sit in their own deployment zone and to go after the objectives in the centre and your opponent's deployment zone. I like this style of mission, as I think the game should be about going after objectives and not just sitting back and just shooting one another. Part 2 of my Chapter Approved 2017 review will look at the new Faction rules for the Orks and Imperial Knights. An Ork warlord can take the Might is Right warlord trait, giving him +1 strength. On a warboss, this will take them up to S7 base, so they will be able to wound most vehicles on a 4+ without any additional weapon. With a Big Choppa, this will take them up to S9, with a Power Klaw, up to S14. This is great, allowing you to wound most vehicles on a 2+ with a warboss with a Power Klaw. This would allow your warlord to tear through most enemy vehicles or units with ease. I can see this being a great warlord trait for an Ork warboss to take. Chapter Approved 2017 was released this weekend, bringing new Relics and Stratagems to many armies in the game, several of which I own. It also expanded the rules on various game modes, such as Apocalypse and Planetstrike. 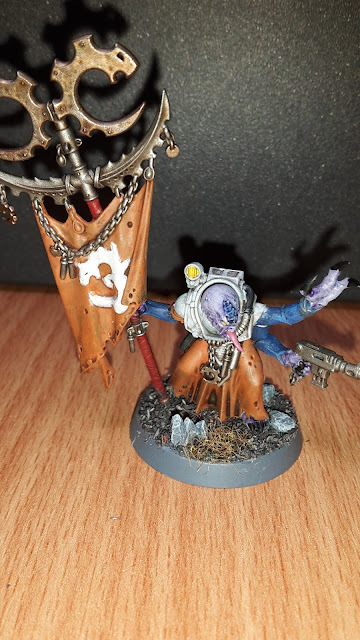 Part 1 of my review will take a look at the new rules for my two most recent armies; Deathwatch and Genestealer Cults. A Deathwatch Character can take the Bane of Monstrosities warlord trait, giving him re-rolls to wound when attacking Vehicles or Monsters. This could be useful on a Watch Master. His re-rolls to hit means he will probably be hitting with all four of his attacks. At S5, he is going to be wounding on a 5+ against most vehicles and monsters, so this could help him gain an extra wound or two if you are rolling well. With D3 wounds with the Guardian Spear, this could be useful for taking a few wounds off any enemy vehicle or monster. Not great for me. I would probably stick with the +1 attack warlord trait or the 6+ FNP one, as I tend to send my Watch Master after infantry targets most of the time. This week, I have been able to complete the Aberrants for my Genestealer Cult army. I now have 8 of these beasts to use in games. 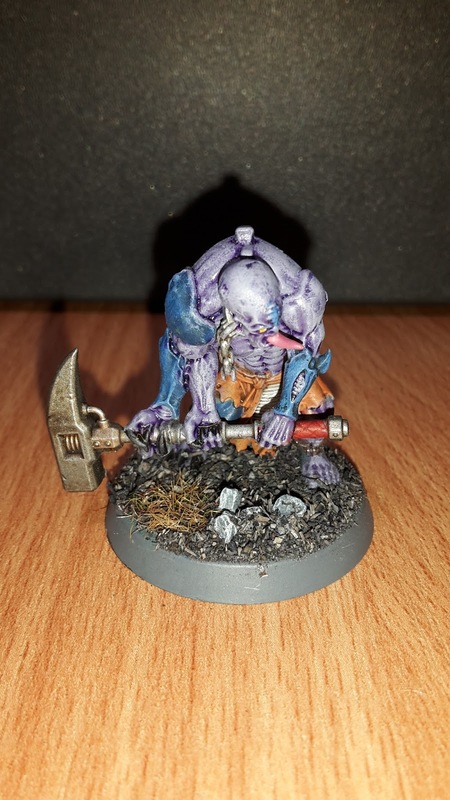 Here are some WIP shots and the final models.